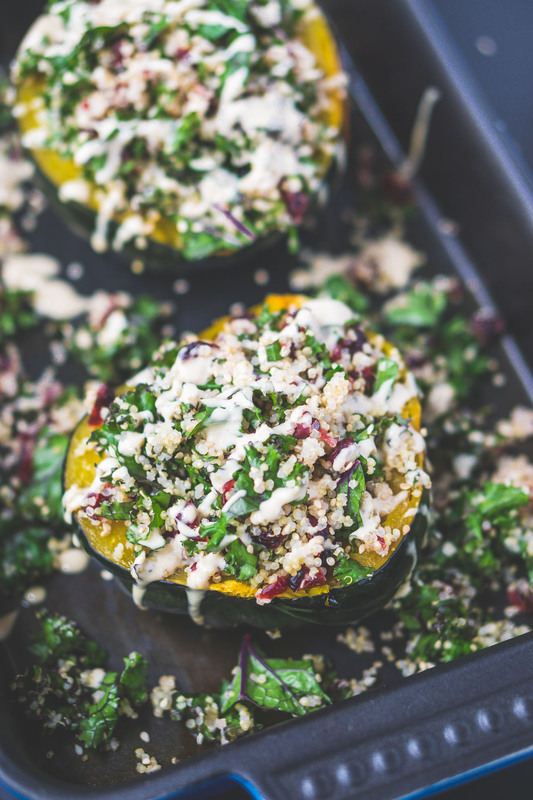 Stuffed Acorn Squash Salad | Eat. Love. Namaste. I love all things fall; especially when the leaves begin to change colors and the abundance of squash and pumpkins that are freshly harvested! Before it’s full-on Fall, the weather can be very unpredictable. It can be hot and muggy one day and then, cool and crisp the next. On those crisp days, my cravings tend to go for savory and warm, flavorful Feastables. It’s a well-balanced meal that is delicious, savory, and healthy! To add an extra boost of flavor and a bit of protein, top the salad with roasted chickpeas! I hope you all love this! 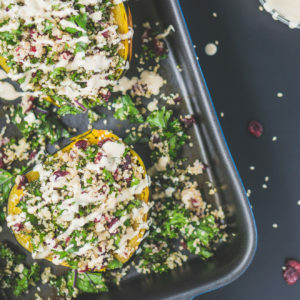 This Stuffed Acorn Squash Salad is a well-balanced meal that is delicious, savory, and healthy! 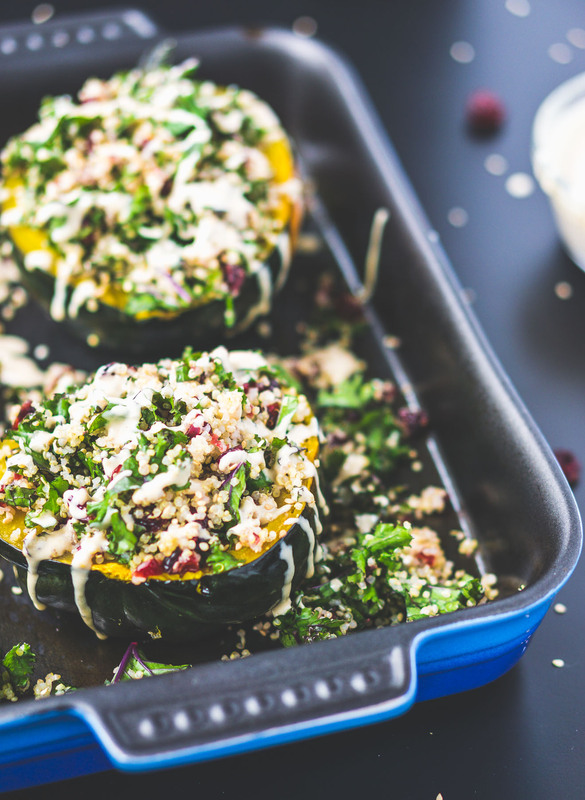 This is one of the best meals that is perfect for the early fall days! 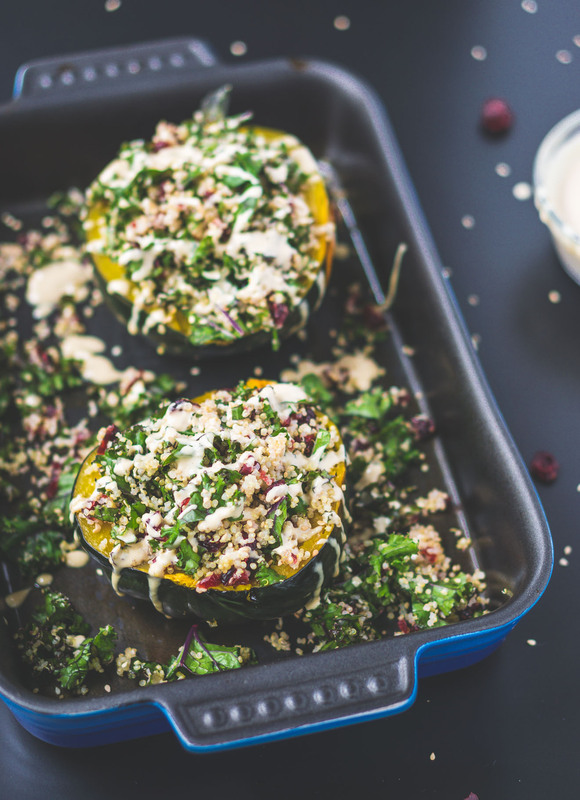 Preheat oven to 400 degrees Fahrenheit and carefully use a sharp knife to halve the acorn squash lengthwise. Scoop out seeds with a spoon and drizzle with melted coconut oil and room temperature maple syrup. 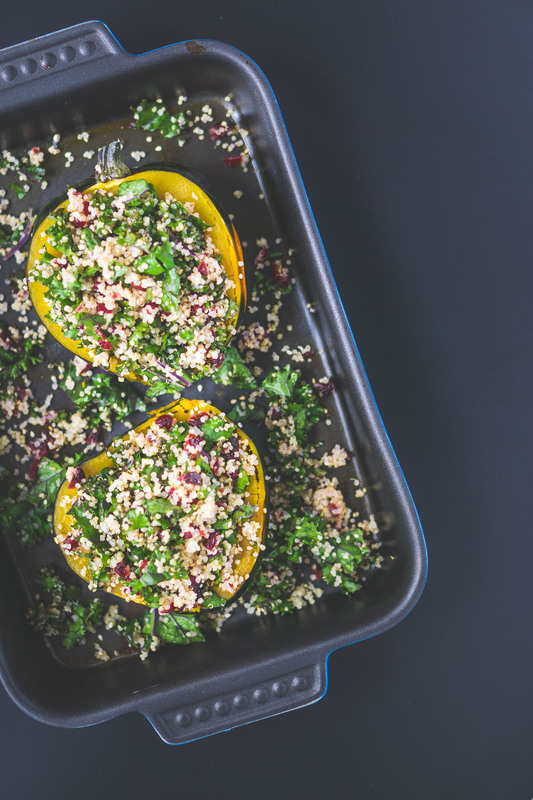 Place squash on a rimmed baking dish faced down, and cover with foil. Bake for 30 minutes covered, then remove the foil and bake for an additional 30 minutes, or until squash is fork tender and golden brown on the edges. Set aside. In the meantime, make the salad. Cook quinoa accordingly to the packaged. 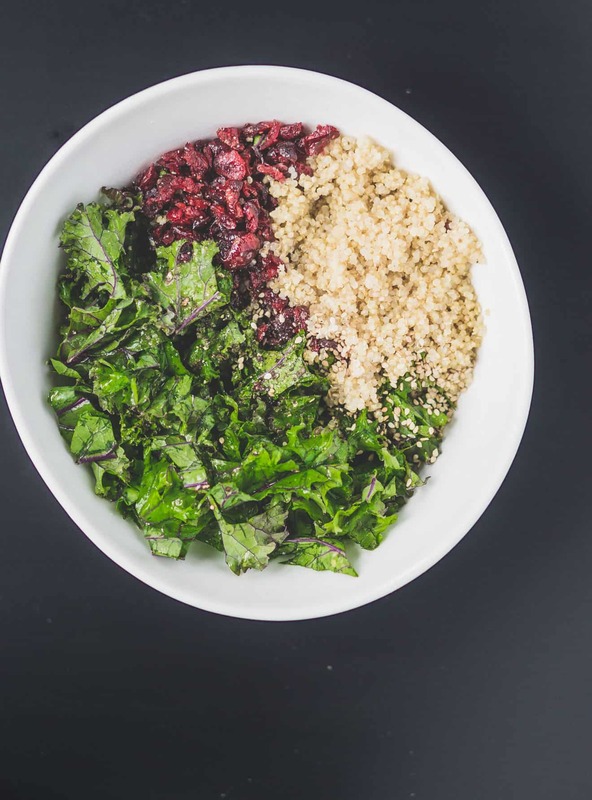 Once cooked, add the quinoa to a mixing bowl. Add in the chopped kale, dried cranberries, sesame seeds, lemon juice, and salt and pepper. Add all ingredients to a mixing bowl and whisk together adding 1 tablespoon of water at a time until desired consistency. Taste and season with salt and pepper. 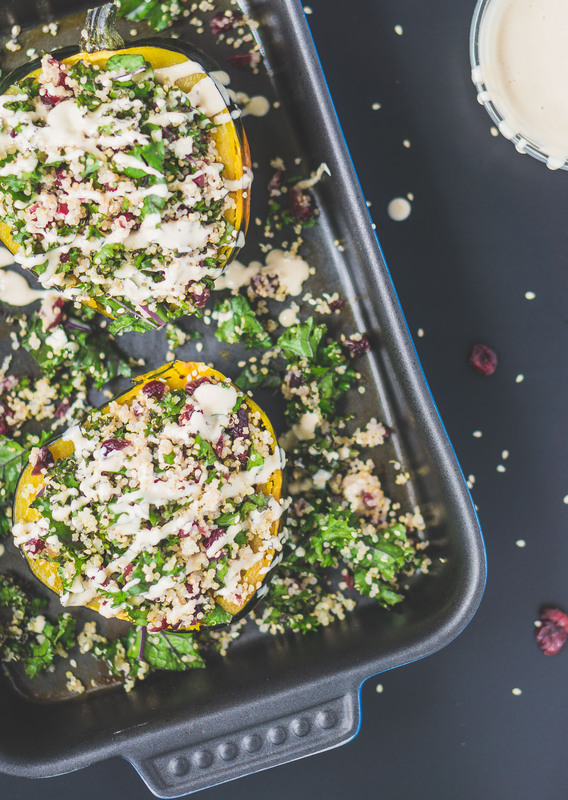 Stuff the cooked acorn squash with the quinoa-kale salad mixture, top with tahini dressing, additional sesame seeds, and roasted chickpeas (optional). Serve immediately.